Tigers are the largest cat species in the world and the third-largest carnivore on land--only polar and brown bears are larger. An adult Amur or Siberian tiger (the largest subspecies) can weigh up to 660 pounds. 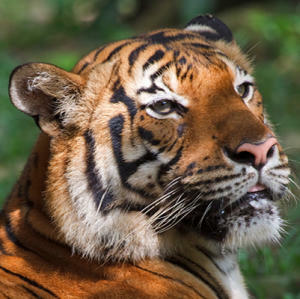 The Sumatran tiger is the smallest, with males only weighing up to 310 pounds. Females generally weigh less than males in all subspecies. 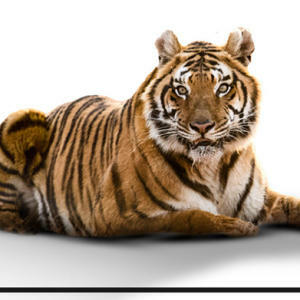 Tigers are the only cat species that are completely striped. They even have stripes on their skin. Stripe density varies by subspecies. The stripes on a Sumatran tiger are closer together than those on any other subspecies. No two tigers have the same stripes. Like human fingerprints, their stripe patterns are unique to each individual. Stripes range in color from light brown to black and are not symmetrical on both sides of the tiger. A tiger's tail is about three feet long and helps them balance when making tight turns. It's estimated that tiger hunts are only successful about one in every 10 to 20 attempts. An adult tiger can consume up to 88 pounds of meat in one meal and will often stay with its kill or bury it to return and dine over a period of days. It may not kill again for four or five days. 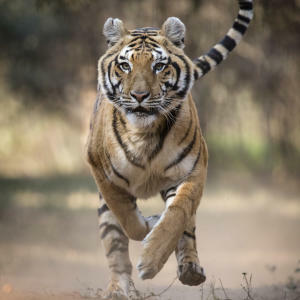 The average lifespan of a wild tiger is 10 - 15 years. But on rare occasion, they have been known to live up to 26 years in the wild. 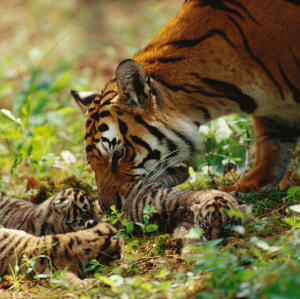 Female tigers are super moms. After a gestation period of a little more than three months, they give birth (on average) to two to three blind and helpless cubs. The female is the sole provider for them until they reach independence at two years of age. 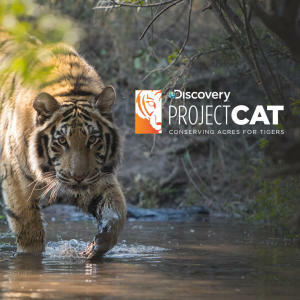 Unlike most big cats, tigers are powerful swimmers and have been known to swim great distances to hunt or cross rivers. Young tigers often play in water and adults will lounge in streams or lakes to stay cool during the heat of the day. Tigers do not live in permanent groups like lions do. For the most part, they live solitary lives except when females are raising cubs. Although rarely seen, the term for a group of tigers is a "streak." 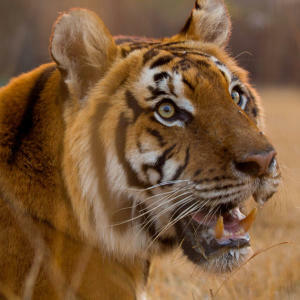 You can hear a tiger's roar from up to two miles away. Tiger vocalizations include roaring, growling, hissing, moaning and chuffing. Tigers are generally nocturnal hunters. Their night vision is up to six-times greater than ours. But they're also opportunists, which means they won't pass up the chance for a daytime snack when it's available. A tiger's hind legs are longer than its front legs, giving them the ability to leap forward 20 - 30 feet in one jump. Tigers have large, padded, feet that make it easier for them to silently stalk their prey. Tigers are ambush hunters preferring to sneak up on their prey before exploding into action, killing them with a bite to the neck or back of the head. They mainly hunt deer, wild boar, buffalo and antelope. But they'll kill and eat what's available, from small birds to bears to the occasional elephant. White spots on the backs of their ears are sometimes thought to function as "eyes" to ward off potential attackers from the rear. Another theory is that they help tiger cubs follow their mothers through tall grass. White tigers are not a separate subspecies nor are they albino. They are leucistic, the result of a recessive gene from each parent that affects pigmentation. White tigers typically have blue eyes. Tigers are a keystone species. They're integral to the health of the ecosystems in which they live. As apex predators, they keep prey species under control. This protects the vegetation which in turn maintains the integrity of streams, forests and croplands that provide people around the world with clean air, water, food and financial benefits. When we protect tigers, we protect ourselves.